With no classes or homework over the summer, kids can quickly become inactive. Keeping your kids moving and engaged in physical activity during summer break can be challenging, especially when it’s hot outside and the video games start calling. Roller skating is a classic summer activity, but most people don’t realize it’s also an excellent way to get a workout! Depending on how hard you go, you can burn up to 600 calories per hour at the rink. It’s also a low impact and super fun was to get the heart pumping! At Skate Moore, we can help you set up a private party, or give you all the information you need for public skating hours and pricing. 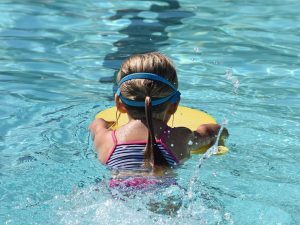 A summer membership to the public pool is a great way to keep your kids active all season long. From swimming lessons to good old fashioned horse play with new and old friends, kids can increase their water skills and have a great time doing it. Check out Eagle Harbor Aquatic Center for a family-friendly, inexpensive pool close to Moore. Help your kids find their center this summer with family-friendly yoga classes! It’s never too early to start finding balance between the mind and body. Spirit House Yoga provides classes suitable for all ages. Taking your kid to weekly yoga classes over the summer can be fun and a great way for you to share in the activity, too! These are just a few ways to keep your kids active this summer. There are probably a million more activities you can get into, though. All you have to do is be creative and give it a little thought. But remember, the key to getting your kid off the couch and out being active is to make the experience fun as well as good for them physically!